Our Executive Information Dashboard provides Executives and Managers a snapshot of the vital arteries of their company, displaying in detail: Receivables, Payables, Cash Flow, Inventory Levels, Sales Analysis and Forecasting. Our developers customize the Dashboard to fit each company’s specific business needs, ensuring a comprehensive and accurate view of the current state of the company. All information is exportable in Excel or Plain Paper format, and allows for in-depth analysis. 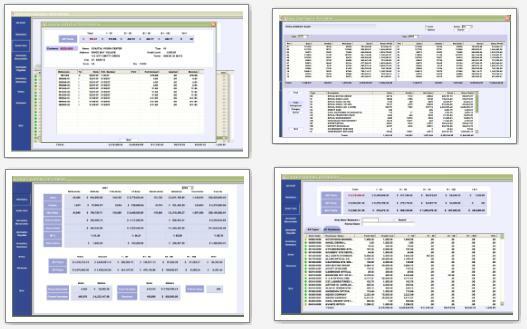 Executives and Managers will enjoy visual indicators highlighting problem areas, comprehensive sorting and selections, comparisons between different years, quarters, periods, break down of sales trends to the weekly and daily level, the ability to drill down to specific customers, vendors, and individual invoices. The Dashboard is fully customizable down to the slightest detail, capable of adjusting to any set of business rules and, with the benefit of an Oracle database, can provide instantaneous reporting, as well as access to Dashboard information through third-party report writing tools.